The following is a contribution from Monica at Monica on Money. If you’re interested in contributing to Frugal Rules, please consult our guidelines and contact us. Certainly, there are several reasonable options instead of cable these days. There’s the very popular Netflix or Hulu for only $8 per month. There are also the smartphone Apps that allow you to watch TV shows if you have a subscription. The Amazon Fire TV Stick is a solid option with a one-time $39 payment. These options are MUCH less expensive than a cable subscription and allow you to still watch TV shows or movies once in a while. But, the bottom line is that if you need more money, cancelling your cable is a quick and easy way to save about $100 per month. Think about this for a moment in terms of 5 years. In reality, many people with a cable subscription easily pay over $200 per month for prime channels like HBO or Showtime but we will stick with an average of $100 per month for this calculation. With Cable: In just five years, a cable subscription could cost $6,000! Wow! I personally would rather have the $6,000 to pay off my mortgage or save more for retirement. If you have debt, $6000 would certainly help pay down your debt too. What could you do with $6,000 in extra money? Without Cable: Instead of watching cable, you will be amazed at how much time you instantly have to achieve your goals, whether they are personal goals or financial goals. If you’re in school or college, you will have more time to study for exams and job search. If you have kids, you will have more time to spend quality time with them. If you’re single, you will have more time for friends and family. Without Cable: Your productivity will also increase exponentially! You will become MUCH more productive. Bonus: You might even become more active and healthier too. You will have more time to work out daily instead of sitting on the couch. You will have more time to cook dinner at home. You will have more time to find new hobbies that you’ve always wanted to do, like learning to paint or play the guitar. You will have more time to join local social outdoor activities, like a running club. Do you have cable? Would you consider canceling your cable to save more money? Editor’s note: I could not agree more with Monica. I just spoke about what we did to cancel DirecTV and love the money savings we’re seeing, not to mention time spent doing other more productive things. The preceding was a contribtion from Monica who writes about Saving, Budgeting and Frugal Living on her personal finance blog, Monica On Money. She recently wrote an article about Saving $8400 By Not Having Cable For 7 years. I have only had cable once because it was included in my rent. Otherwise I stream movies and shows. I like that even if you still lose time you don’t lose a full hour with ads to watch a 40 minute show. @Pauline- Exactly! I’d love to have cable included in my rent for when friends or family visit because they’re always asking for it! But I simply don’t like spending an hour just watching TV, I always want to start multi taksing! We still have cable because having a cable TV isn’t that much expensive here in our country. If our cable would be much higher, I’m certainly open to the idea of cancelling it. We’re with you here, Monica. We’re heading on the one-year mark with no cable tv and are very happy about it. Even with our smaller cable package that we had, we’ve already saved over $400 by cutting the cord! @Laurie- That’s amazing! I’m so happy for you! Isn’t it great to see the savings add up? I’ve started to calculate the 1 year and 5 year costs of things lately and the savings can really add up! We have cable and it’s one form of relaxation and entertainment for me when I’m not blogging, working, working out, renovating or spending time with my wife. Cable doesn’t cost us that much plus when we deprive ourselves sometimes it comes back to haunt us. I think it’s a personal decision but for us, cable stays. @Canadian Budget Binder- Absolutely, canceling cable is a personal decision. We all have what we spend our money on and what we choose to do to relax. Thanks for sharing your opinion! I’m on the fence with John here since I have cable I don’t really talk about it much. I am the only one in the family that doesn’t really watch any tv. But then the problem is the shows I really want to watch I cant find/stream like NBA playoffs etc. I know it can save money but its one of those things I probably will never cut. @Thomas- You bring up a great point about sports, unless you go to a friends house, you’re stuck with cable for sports. I got an anntenna for some local sports but it’s not everything, still looking for a better option for sports. I think there’s no denying it’s a “want” unless it somehow is tied to your job/income. I personally do not think I would be any more productive without cable, as I usually blog and enter giveaways with shows on in the background. Heck, I even work on Excel/spreadsheet stuff with something on in the background. It’s just how I’ve always worked. I definitely see your point, though. @DC- That’s exactly how I am when I watch TV! I can’t just sit and focus on watching the TV, I have to write blogs or write emails to stay productive and get more done. Thanks for sharing your point of view too. We have cable and won’t be canceling it. It is our main source of entertainment and only costs us about $40 a month as part of a trio deal. Well worth the amount of time of entertainment we get from it 🙂 We instead negotiate our cable bill whenever we can! @Lance- $40 a month is a great deal for cable, especially if it’s your main source of entertainment! You bring up a great point about negotiating your cable bill whenever you can, great idea! We haven’t had cable in a few years and don’t miss it at all. I don’t think I could bring myself to pay for it again! Good post, Monica! @Holly- Thank you, I’m glad you enjoyed the post! We have cable, but we have a relatively good deal on it. We get nearly every single channel (including HBO and the others) for $50 a month. I just love my TV shows! @Michelle- That’s a good deal too! I used to have TV shows that I loved and I should watch them on the ABC iPad app but I do understand wanting to watch the new shows. I’ve been waiting for Mad Men Season 6 to come out on Nelflix to watch it for free. We’ve just got everything we need to cancel and we’ll be doing so very soon. I’ll miss the sports but I barely watch TV at all anymore these days will all I’ve got going on, so otherwise I don’t even think I’ll notice. It’s definitely a big money-saver. @Matt- Glad to see that you’ve decided to cancel your cable too! It is definitely a big money-saver! 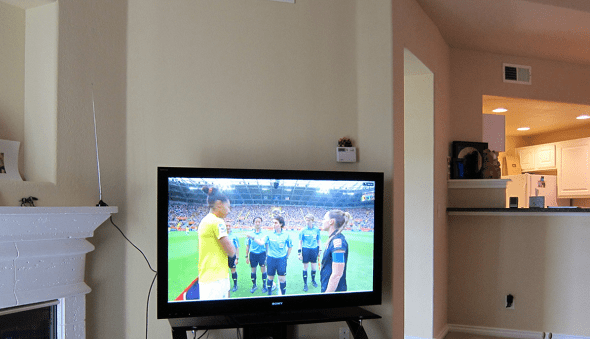 If you try a TV antenna (for $30), you might be able to get local channels with sports. We just got one and have some sports channels and CBS, ABC, and a few other channels. Might be worth looking into. I have always found this an interesting debate. As a student, I did not have cable for the past 1.5 years and I have to say I did not miss it one bit. For one, I had a netflix subscription which allowed me to watch specific shows I like to watch. Further more, I do enjoy watching movies in the theater once in a while so I dont really mind not having cable. @Ankit- Yes, it’s an interesting debate! Some of us find it easy to cancel cable while others enjoy the entertainment value of cable and woudn’t cancel it. It really just comes down to our personal priorities for spending money. Good point that maybe it will be different with a family! I know when I was younger, we spend a lot of time watching cable and it was part of family time. I have been cable free for about a year I think. It has not been bad at all. I think some think they are going to be missing out on a lot of things, but I find that I can get more things done and enjoy life a little more. There is only so much reality TV a person can take. @Grayson- You’re right! When I was in college and had cable in my dorm, we watched ALL of the reality TV shows and new everything about these people’s lives. It was crazy and since then, I haven’t had cable and can’t tell you who the latest American Idol is or who’s on Dancing with the Stars but I’m MUCH more productive! Thanks for bringing up a great point about reality TV. We cancelled our cable subscription about a year ago with no other expectation than to save a few bucks every month. But the other benefits have been overwhelming. I’ve been so much more productive doing other things (like starting a blog), cooking better meals, spending more quality time with our kids, the wife goes through books like nobody’s business and while our kids still get some screen time (games on the IPAD, etc) they aren’t watching a lot of TV with tons of advertisements. As a result, it’s amazing how much their ‘want’ for certain toys and breakfast cereals have decreased. Overall, it’s been real positive in our household. @Buck- I’m glad that you and your family are much more productive without cable. I think it’s great that you each found other forms of entertainment. It’s interesting that their wants have decreased too, TV ads have much an influence on us. Actually, that’s a great idea for a whole new article., I’ll check out your blog too! Looking forward to reading it! I cancelled my cable about a year and a half ago. They gave me a great deal a month later to earn my business back. Now I pay less for cable and internet than I did for just internet…score! Anyway, great to see you around here Monica! @Josh- Great to see you on here too, I hope all is well with the newly updated website. Good for you for getting a great deal on cable! I have never had cable in my life…when I was growing up…I thought I was deprived. But nowadays I really see no need for it. There is plenty to watch on the internet, Netflix and on over the air TV. Plus, even without cable, I feel like I’m wasting a lot of time watching TV…I need to cut out regular TV as well. Haven’t had cable for years. Most shows I watch are free online! @Kasey- That’s great! You’re right that they are so many free shows online these days. Or Netflix and RedBox are cheaper alternatives too. I agree that without cable your productivity increases. Yesterday I tried to work but kept getting caught up in lifetime movies. It’s like I wanted to turn the tv off to focus but I just couldn’t. I’m a bit of a movie fanatic. But I definitely agree with your points. @Romona- I used to love those Lifetime Movies when I was in collge! I could spend an entire day just watching back to back Lifetime Movies like you said. It becomes so hard to focus on anything else. Thanks for sharing! I’m very keen to cancel our cable–the worst value purchase in our home, I think–and the landline and ISP service with which it’s bundled. I’m researching alternatives, and hope to get it all in place by year’s end. @Kurt- That’s great! Maybe in the meantime you can call and negogiate a discount like some of the readers have mentioned. Good luck! I canceled my cable earlier this year and have never looked back. it took some initial set up with buying a digital converter box and rabbit ears (for those times I do want to watch live network TV), but someone gave me their old roku box and I media share with nextflix/hulu plus with a friend, so it’s saved me SO much money. Plus there are several red box’s nearby so that’s a cheap alternative as well! Thanks for bringing up Roku! I don’t have a Roku but I’ve been meaning to look into it for other options. I have AppleTV which is pretty limiting actually but I can use it for Neflex too. I’ve given lots of thought to cutting cable. One of the reasons is that life is so busy these days we really don’t have much time to watch anyway. The problem in actually getting rid of it though is that it’s bundled with my internet (can’t get rid of that) and work phone, so in the end I probably wouldn’t be saving all that much. Plus, I don’t think I could ever convince my wife to agree to letting it go. As for me, the most difficult challenge would be to miss live sports which you obviously can’t get on netflix, hulu, etc. and I’m not interested in viewing those events via illegal streams. @Mr. Utopia- Those are all excellent reasons for keeping your cable! Thanks for sharing your opinion too! You bring up a great point about being able to bundle your cable, phone, and internet and save money that way. I don’t have a home phone (although I’ve been thinking about it for emerencies) but that’s a great idea to consider. We still have cable and don’t have any immediate plans to cancel it. I do agree that it’s an easy way to save money but we (mostly husband and kids) enjoy it enough that it justifies the cost for us. If we were in debt (beyond mortgage), I may feel differently but right now it’s just part of our entertainment budget. @Shannon- I like how you said that cable is part of your entertainment budget. We all have our priorities and what we spend money on and it all comes down to whether our budgets can support it. Thanks for sharing! Cable is so overrated and expensive…in our area NBC may still be off the air–it was for awhile. It’s amazing how much you can still find to watch on TV and do I really want to pay to see Miley do whatever it is she did? @Kelly- Wow, good point about Miley! Some of the TV Shows and movies that are on cable TV really make me wonder if it’s worth having cable. I’d much rather pick and choose shows on RedBox or Netflix. We´ve got cable, but it´s included in our rent, mostly because our landlords are just nice people, so we don´t pay anything for it. But I could definitely do without, because I mostly stream tv-shows online! @Norwegian Girl- Getting your cable including with the rent is a great deal! Thanks for commenting, I didn’t realize that some landlords are providing cable too. Awesome! We are in process of cutting the cable out as well. Just a matter of hitting a specific date for lower “cancellation fee’s”. One thing to note – – – I highly suggest anyone considering cutting cable to budget for $20-30 for tv shoes and/or movies. For example, we are preparing to budget for $20 of tv and or movie purchases each month that we will purchase through Amazon on our tv. We will save $70-80 after this budgeted amount, but make sure to take that into consideration. We were holdouts for years, but cancelled in July. It has been great without all the bleeps from blocking out swear words and erectile dysfunction commercials. We have Netflix and order movies from Amazon when we want to. I don’t miss it at all. @Kim- HAHAHA! Your comment literally has me laughing out loud, too funny! You bring up a great point about Amazon having movies too. I have Amazon prime and always forget about the free instant movies, thanks for remidning me! As soon as my contract (grrrr) is over cable is going bye-bye!! Thanks for the inspiration. @Tony- You’re welcome!! I’m glad that my article inspired you. I’ve love to hear back after you’ve cancelled your cable to see if you’re happy with your decision. At the very least you should call and get your bill lowered. I had a Dish Network package that gave me $50+ channels for a measly $14.99/month. Called the Intro package. @Kyle- $14.99 per month is a really great deal and worth looking into. Do you remember if that was only for the first year or just the stanard rate? That’s a great deal either way. Thanks for including those numbers for some perspective. I just canceled my cable about an hour ago, before reading this article and comments. It is so nice to know I made the right decision. Been wanting to do it for years. Direct tv made it very hard to cancel. Every thing is automated so it is hard to get to a real live person, but with patience and preserverence I finally got through to someone. Even though I paid my bill in full, there might be some additional charges. also, a box will be mailed to me to put my boxes and remotes in for return, I have 18 days to return the box. I won’t miss them at all. @Joann- Wow!! I can’t believe that you JUST cancelled your cancel. I’m glad that this article was timely for you and congrats for cancelling your cable! I’ve never had Direct TV but I’m sorry it’s been difficult for you to cancel. Thanks for your comments. We used to have a cable before but I canceled it a year ago because it’s not necessary to have one. I’d rather paying internet bills monthly than paying with unused cables. I don’t usually watch TV, I’m just in front of my laptop always. Thanks for a great article Monica! This is something I’ve been thinking about for a while now but haven’t been able to pull the trigger. One of the reasons is I would have to pay an early termination fee of a few hundred dollars, which is not too bad in the long run. But the main reason for me is I’m a HUGE sports fan, especially pro basketball and football. They’re starting to show more and more games on cable now so I have to find an alternative for that. This article has spurred me back into action thought and I will bite the bullet and dump cable once my plan is up in a few months. @Syed- I’m glad that you enjoyed the article and that it gave you the motivation to cancel your cable!! Awesome!! Wow, I didn’t realilze that cable companies have an early temination fee too but it’s important to consider when you make the decision to cancel cable. Thanks for sharing and good luck with cancelling! Here in Romania, cable is extremely cheap (about $10 per month) so we still keep it, even though we don’t watch TV like our parents do. But we do have a couple of TV shows that we “must” watch and we consider it cheap entertainment. We’ve made the switch to watching movies from free streaming websites and free shows and it’s going great for now. I am sure that we wouldn’t really miss our cable if we were to cancel it. Wow, I’m so jealous that cable is only $10 per month!! That’s an amazingly great deal, I think my cable box years ago was was $10 per month just to rent it. Thanks for sharing your experiences in Romania, very interesting! I haven’t had cable for a year now. At first I thought I would really miss it but I don’t – at all. I went from a reality show addict to having a huge spike in productivity. I use my extra time to work on my side hustles now. Plus, I love, love, love the fact that my kids have to use their imaginations and be active rather than be glued to the TV. @Alexa- Your comment about reality TV reminds me of my college days where we watched the Bachelor and Dancing with the Stars marathons! Talk about a lack of productivity!! I think you make a great point about your kids having to use their imaginations instead of watching TV. Have a great weekend! @Daisy- Wow, your comment about it not being 1992 has me laughing out loud! But you’re right, and back then my family had cable to entertain us kids. I love how easy it is to watch tv shows on the computer now instead. Thanks for the comment, have a great day! Great insights on this post. I also wrote about cutting the cable a year back. I am with you on this Monica. Indeed there are people who think they cannot live without cable and maybe they’re right. But for those who have different sets of priorities cutting the cord is a great way to add on the savings. It’s really important to assess wants vs needs when making this decision or any financial decision for that matter. And John is right that the beauty of personal finance is that it’s a personal choice. @Marissa- I completely agree with you and John that it’s a personal choice. I’d love to read your article on cutting cable too, I’ll head over to your blog to search for it! I am most definitely a cable cutter. When I was laid off from my tech job last year, I did two things immediately – and one of them was cancel my Directv and switch to Netflix and Roku. I’ve saved almost $1,000 so far, and absolutely love it. Cheaper. More interesting content. No ads. I’m never going back. I’m a huge fan of cutting cable. I’ve even written an article similar to this one. Last month something crazy happened… my internet bill went up and I called to get it lowered. Now I spend $30 less a month and I have basic cable. In my house it actually would cost more money NOT to have cable. @Michael- Wow, that’s actually pretty funny and it’s a great example of the varying prices and options with bundling internet with cable. I’m happy for you! I’ll check out your article on saving on cable too. Thanks for sharing!